Tra-La-La…the Captain is back! There’s something rotten in the state of Ohio, and it’s smellier than a pile of putrid gym socks! Steer clear–it’s Sir Stinks-A-Lot! George, Harold, and their doubles, Yesterday George and Yesterday Harold, have a good thing going. Two of them go to school, while the other two hide in the tree house and play video games all day–then they switch! But when their malicious gym teacher, Mr. Meaner, creates a method of mind control that turns their fellow students into attentive, obedient, perfect children, the future of all humanity will be in their hands! The kids really love these books and we love when they read. It’s just so much better for the kids to be able to use their minds and their imagination. They read all summer long…and it was not even a chore for them. It’s such a good way to keep their minds working. I guess that’s why their school assigns at least 30 minutes of reading each night. It’s even more of a focus for us this year as both Natalie and Liam have teachers that offer incentives for them to read…5, 10, 25 books. It’s perfect! In fact, we kind of think that reading gives you superpowers…don’t you? So, what do you think about reading, and about the Captain Underpants series? It’s just so perfect, we love the series. It really makes reading and building those superpowers fun. 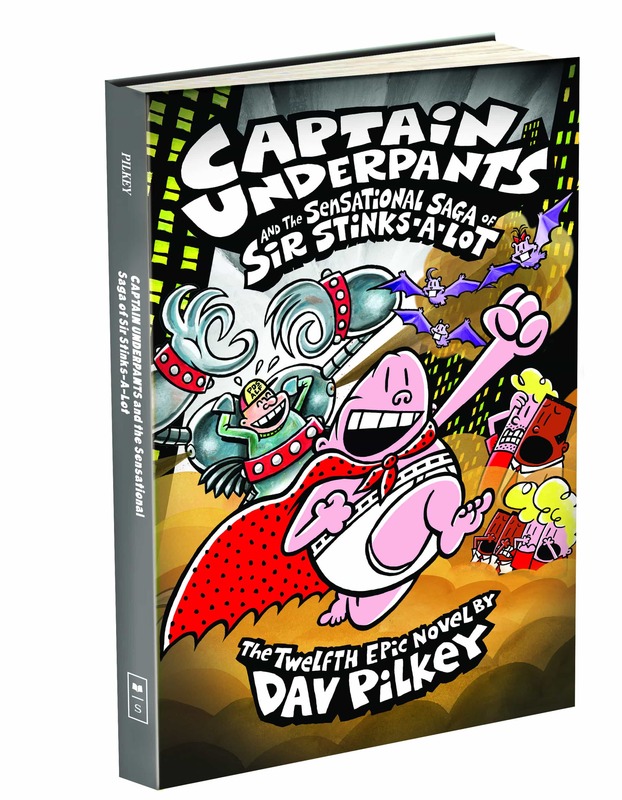 Captain Underpants and the Sensational Saga of Sir Stinks-A-Lot is IN STORES NOW!!! Best friends George Beard and Harold Hutchins are the unofficial class clowns of fourth grade. There’s nothing they love more than making comic books about a silly superhero named Captain Underpants. But now they’ve accidentally transformed their mean school principal, Mr. Krupp, into Captain Underpants himself! Join George, Harold, and the Waistband Warrior as they fight for Truth, Justice, and all that is Pre-Shrunk and Cottony – and save the world, too! 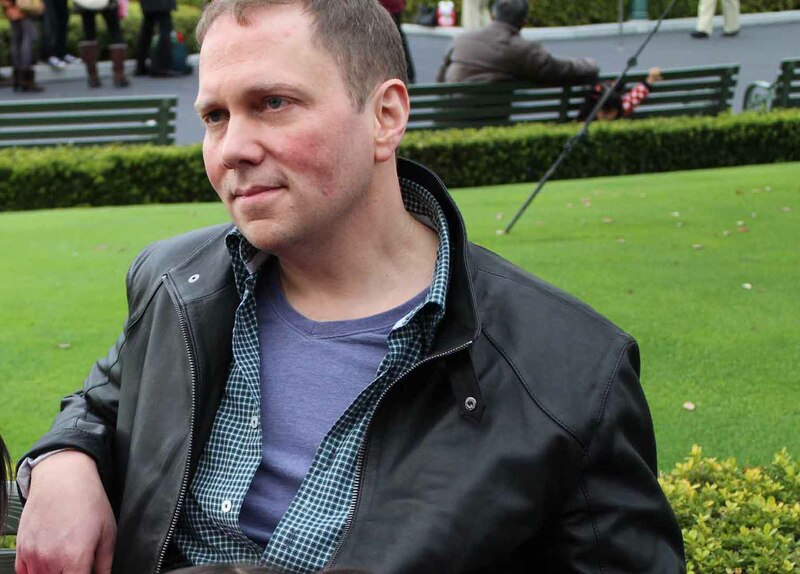 When Dav Pilkey was a kid, he suffered from ADHD, dyslexia, and behavioral problems. Dav was so disruptive in class that his teachers made him sit out in the hall every day. Luckily, Dav loved to draw and make up stories, so he spent his time in the hallway creating his own original comic books. In the second grade, Dav Pilkey created a comic book about a superhero named Captain Underpants. His teacher ripped it up and told him he couldn’t spend the rest of his life making silly books. Fortunately, Dav was not a very good listener. Dav continues to create books in the Pacific Northwest where he lives with his wife. Visit him online at www.pilkey.com. *This post is sponsored by Scholastic. All opinions and my kid’s opinions are fully our own.